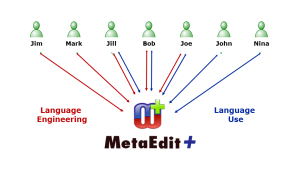 MetaEdit+ runs as a single-user or multi-user environment. In both cases the heart of the MetaEdit+ environment is the Object Repository. It contains all information in MetaEdit+, including language definitions, diagrams, matrices, objects, properties, and even font selections. Hence, modification of system designs in one tool or MetaEdit+ client is automatically reflected everywhere it appears, guaranteeing consistent and up to date information. Similarly, reporting and code generation are based directly on the information stored in the repository. Unlike any other modeling environment, the MetaEdit+ multi-user environment allows users to work on different platforms, with different license types as well as different access rights. The Object Repository can store billions of design objects. 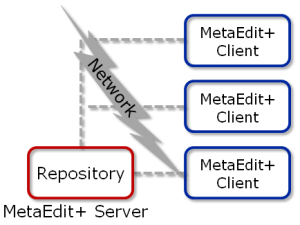 It manages multi-user concurrency at a very fine-grained level. By locking only the minimum amount of design information it allows multiple users to work on the same models, often even on the same objects, minimizing lock-outs while ensuring there will be no design data conflicts. Also unique is that each MetaEdit+ Object Repository can contain multiple domain-specific languages, models and code generators. The latest modifications to modeling languages and code generators are available to all users in real-time: there is no need to compile a language prior to making it available. This way you can share and update complete modeling languages, and of course models, effectively.